A restaurant in California is now employing a burger-flipping robot. There are plans to install the system in dozens of other locations. Designed and built by Miso Robotics, the machine seen here is called "Flippy". It will begin working alongside kitchen staff at CaliBurger, a hamburger restaurant in Pasadena, California. According to its makers, Flippy cooks perfectly and consistently every time – using 3D, thermal, and regular cameras to recognise and monitor the food throughout the cooking process. Between 150 and 300 burgers per hour can be cooked, depending on the kitchen staff. Flippy knows when to switch from using a spatula for raw meat to one for cooked meat. It can even clean the spatulas while cooking, and wipe the surface of the grill with a scraper. The machine can be used in any commercial kitchen, is fully wash down compatible and OSHA compliant. It learns from its surroundings and improves over time. "I couldn't be more proud of my incredibly talented team for their hard work in bringing Flippy to life – and we are just getting started," said David Zito, CEO and co-founder of Miso Robotics. "Our mission is to improve working conditions of chefs and line cooks with assistants, not replace them. Anyone who's ever worked in a restaurant knows how hard the work is and the value of extra hands and that's exactly what we built." "The deployment of Flippy in CaliBurger restaurants represents a major milestone in helping our staff produce mouth-watering burgers more consistently and in a timely manner. The ease of integration into our existing kitchen lines will also allow us to quickly install Flippy in more locations nationwide." said John Miller, chairman of Cali Group. "A day will come where it will be odd to go into a restaurant where you don't have all the benefits of robotic systems." "The kitchen of the future will always have people in it, but we see that kitchen as having people and robots. This technology is not about replacing jobs – we see Flippy as that third hand," added Zito. Each robot is priced at $60,000 and will cost a further $12,000 a year to run. 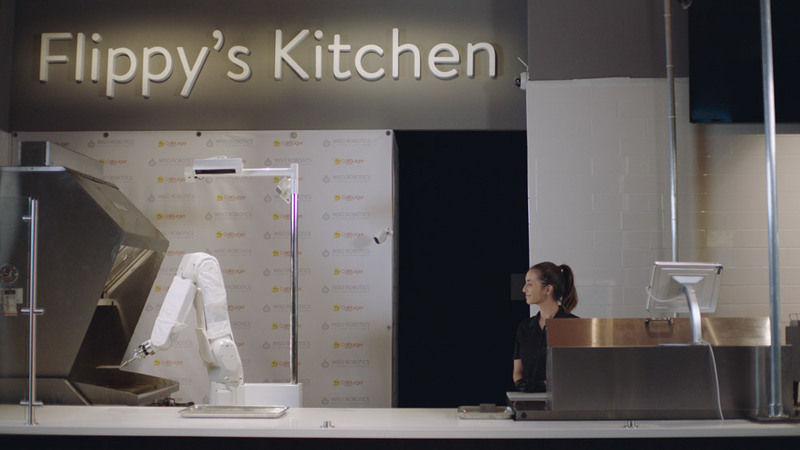 CaliBurger has exclusive rights to Flippy for the first six months, after which other fast food vendors will be able to purchase and install the robot. Last year, a report by the McKinsey Global Institute concluded that fast food was among the industries most susceptible to automation.